RECONSTRUCTION OF THE SCAJAQUADA EXPRESSWAY IS SLATED TO START THIS SUMMER, BUT THAT HAS NOT SETTLED NEIGHBORHOOD VIEWS ON THE NEW YORK STATE DEPARTMENT OF TRANSPORTATION’S PLAN. A crowded public meeting Wednesday night was generally opposed to the plan. 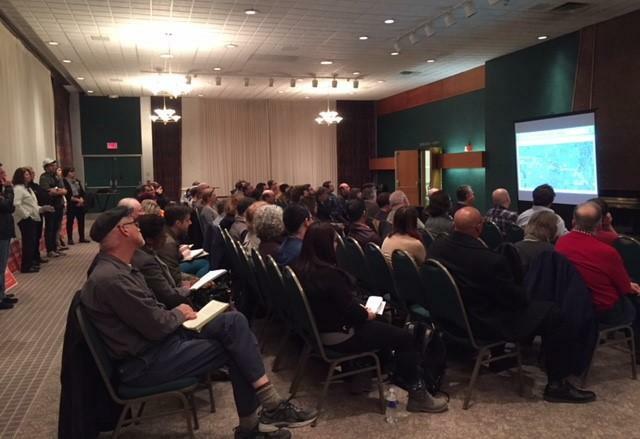 The meeting at Canisius College’s student center was sponsored by the Buffalo Olmsted Parks Conservancy and the Restore Our Community Coalition, both groups fighting for changes in the Scajaquada and the Kensington Expressway. The DOT has $104 million to make major changes in the road and has completed a series of design plans, based upon public feedback. As the latest state plan will potentially require turning parkland into more roadway, the opposition is organizing. Olmsted Executive Director Stephanie Crockatt maintains it is a bad plan. There is also a major road expansion where the expressway crosses Delaware Avenue. Crockatt said she is hoping the DOT comes back to the table instead of doing a “my way or the highway” approach. She said there has not been a response from the DOT about Olmsted’s alternative plan, which does not include paving over more of Delaware Park.